As a teenager I remember constantly battling the aggravating effects of acne. It was a bummer then and I knew that once I became a parent to a teen it would be important to help my teen create an easy morning and evening skin cleansing routine that would help their skin to be healthy. Let’s face it, at that age, how their skin looks and feels is an important component of their emerging self image. Overall, I think we have found great success with AcneFree and today I am excited to invite my daughter to guest post alongside me to share her morning and evening skin care routine and how the full line of AcneFree products help her to treat and control her acne. AcneFree is simple to incorporate into her busy lifestyle in both the morning and evening, which is important when your child is as super busy as mine. Plus using the products help her to feel confident with herself and her skin. Turning a little time over to my cute kid now! Hi guys! Samantha here. I wanted to share with all of you how I use AcneFree everyday to help keep my skin healthy. My Mom created this cute little basket that helps me to keep all of my morning and evening cleansing products in one place. And since most mornings and even evenings are crazy busy, it really helps. I can take it anywhere. That is kind of a big deal, so thanks Mom! My Mom also included some scrunchies and new headbands. Score! Pictures are fine and all, but most kids my age watch videos. When I need help with something I look for a video on Youtube, so that is what we are going to do here. I am going to share how to use the AcneFree Sonic Advanced Cleansing Duo, which I use at night and the AcneFree Daily Skin Therapy system that I use in the morning. Thanks Samantha! Isn’t she cute! I love how confidently she shares how the AcneFree products help her to put her best face forward! So now that you had a chance to catch Samantha’s short tutorial video, here are some important things you should know about the NEW Sonic Advanced Cleansing Duo from AcneFree. She uses this at night and we both loved the price point on this, because there is no need to pay over $100 in a department store when you can now go to WalMart to get a great cleansing brush! Plus the entire set is easily portable and can be taken everywhere she goes. Included in the Cleansing Duo is a Purifying Facial Cleansing Brush plus an Oil-Free Purifying Cleanser. The Oil Free Cleanser clears blackheads and acne breakouts and Samantha thought that the Purifying Facial Cleansing Brush, which uses dermal stimulation technology to gently deep clean pores was pretty fantastic! The brush delivers 8,000 pulsations per minute and the pulsations are channeled through a soft, comfortable silicone head to gently exfoliate your skin and remove dirt and oil. Fabulous! The brush is super to easy to use and no additional brush heads are needed because it’s easy to clean. The smooth, rounded touch points massage the face and are nonabrasive enough for daily use. That is winning there! Now let’s talk about the AcneFree Daily Skin Therapy Line. Samantha shared how to use the products in her tutorial video, but here are some things to keep in mind! It is a great new 3-Step line from AcneFree that helps rebalance acne-prone skin! You can buy each product separately at Walmart or you can buy all three to benefit from the full line and start a healthy routine for your skin! The AcneFree Therapy Line is easy to incorporate into your teen’s busy morning schedule. As Samantha explained, I created a cute little basket for her to be able to easily grab what she needs when she needs it. Let’s first talk about the Acne Wash. The Acne Wash has Pore Targeting formula and Patented Avocado Extract Technology that was shown to reduce oil and shine! It also helps prevent new Acne from forming and is a Dermatologist tested formula that is soap-free and clean rinsing. It also removes dirt and oil deep down to the pores and purifies the skin to help prevent breakouts with the Active Ingredient 2% Salicylic Acid. Again all great benefits! The second step in the Therapy Line is the Daily Skin Therapy Pads. They are great new pads that unclog pores and tone your skin! Each pad contains a dermatologist tested formula designed to open blocked pores while thoroughly cleaning your skin and preventing new acne from forming! The soothing menthol leaves your face feeling refreshed and clean. The third and final step in the Daily Sin Therapy Line is the Complexion Perfecting Cream. It gently renews skin’s appearance for a clearer complexion. The lightweight Cream contains Advanced Retinol Technology that allows controlled release of Retinol throughout the day to reveal healthier looking skin plus it has added skin conditioners and humectants to help keep the skin moisturized! I hope you have learned a few tips here to help your busy teen create a good skin care routine and both you and or your teen can try AcneFree today to get healthier looking skin so you can put your best face forward! 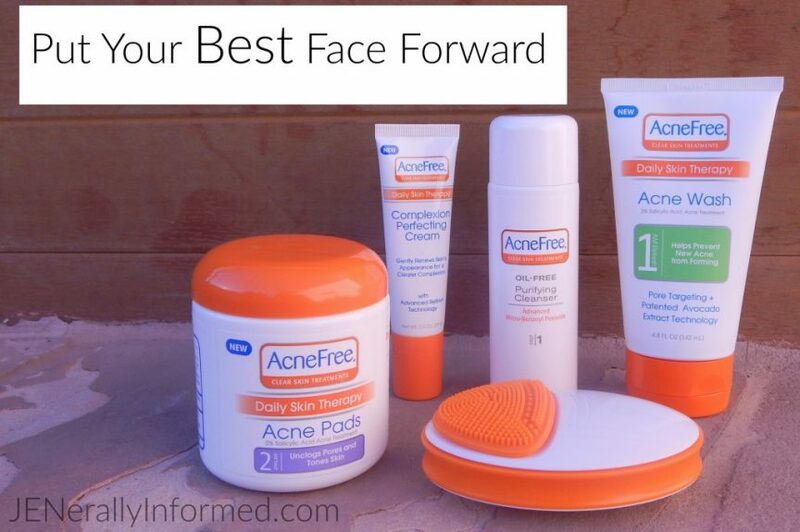 For product information and savings, visit acnefree.com. Want to be part of the AcneFree community? Join the conversation and share your skincare routine and success stories on Instagram, Facebook and Instagram. Love that you turned this over to your daughter and got to say she did a great job laying this all out for us. Still have issues with acne from time-to-time myself even so many years past my teen years and going to have to check this out at my local Walmart now when I can. So, thank you so much for sharing. Thank you! She was a pretty swell guest poster. Ugh, acne! Me too! I wonder how old I will be before acne goes away, finally?!! I so remember my teen years. Oh to have had this back in the 60s. I would have been thrilled. Ugh. I had the WORST skin in high school and well into adulthood. I definitely would have tried this back then. Me too! Oh how I wish this had been around for me when I was a teen! Luckily our kiddos have better options right? I love that your daughter did the video! YES – she’s so sweet! She’s natural on camera… friendly and very trustworthy spokesperson! Well done! I wish I had acne products like this when I was a teen. My skin was the worst when I was 13-15 years old. I still get blemish breakouts (once a month when Aunt Flow comes). Thanks for sharing and thank you Samantha for the great demonstration! Jennifer | The Deliberate Mom recently posted…How to Manage Your Life So You Can Get More Blogging Done! I still get those break outs too, they seem like under ground mountains though when they come that are TERRIBLE! When those hit that is definitely when I grab Sam’s AcneFree! My son could use this. His face is breaking out. And some is mine at times, ugh. Hi Samantha! Great job on your post. I love the basket your mom put together; too cute! These do sound like some great products. I like the look of the brush. The brush really is fantastic! Thank you, she really did a great job! The AcneFree products are indeed pretty fantastic! Oh goodness I LOVE that you had your daughter guest post. I never really had acne problems but I am bracing myself in case my girls do. It is nice to know that there are some great products like these out there. She’s such a beauty! With glowing skin. What an awesome idea. Oddly, I had my worst bout of acne as a young adult, and not as a teen. And it was dreadful. Good products are important. Tamara recently posted…All Grown Up: BLT Grilled Cheese. Aww thanks, I will be sure to pass on the compliment! Kiddos that age need to hear things like that quite often! Amen to good products! I got a huge zit right on the center of my nose last week and I was like WHAT?? !